A new month is always exciting - it is a fresh start, there are new experiences to be made and new subscription boxes to be had. And for me, this also means that it is time to pick my LLABP products to review! All through March I was on a personal spending ban, which meant I was not allowed to buy any new products (other than what came in my pre-paid subscriptions). 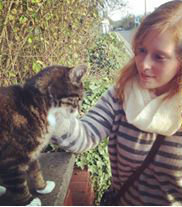 I made it most of the way through without incident, and ended up using up loads of my stash which was fantastic. As a reward, I decided April would be my month to try out brands I have never experienced before (though I am still trying to withhold spending on too many extras!). You may have seen a sneak peek of my LLABP picks on Instagram and Twitter earlier this month, and don't worry, I will definitely be doing a full review of each of the gorgeous products. In fact, today I will be sharing one of my choices! The Rose Tree is a British beauty brand that is dedicated to designing products that are natural, organic, powerful, and transparent. They care about the whole process, from ground to shelf, and promise ethical sourcing of ingredients, no animal cruelty, and good wholesome formulas. On top of that, they guarantee "stunningly effective" skincare that is luxurious and designed for modern women. 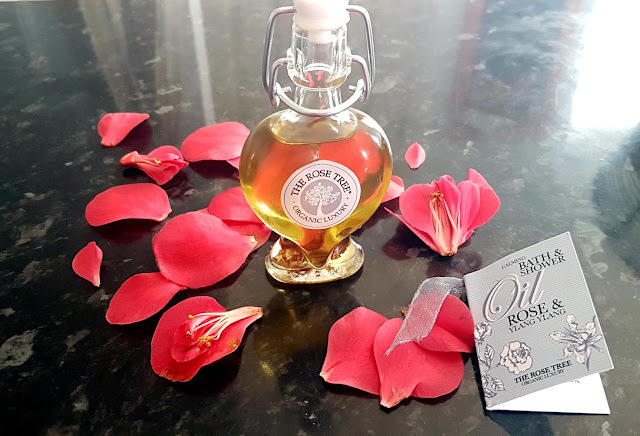 Well, I can say that The Rose Tree most definitely 'rose' to the occassion with their Rose and Ylang Ylang Bath and Shower Oil! If you follow me on any account, you know by now that I adore a bath at the weekend. This helps me unwind and regroup after a long, hectic week, and I rely on various products to soothe my mind, body, and spirit during my 'me time.' And I have to say, after only a few uses, this bath oil has quickly become a favourite of mine. The oil comes in a beautiful heart shaped glass bottle, and there is almost no plastic in sight in the packaging. Only the top of the stopper is not made from rubber or glass, but seeing how cute this bottle is I think I'll be reusing it. When it comes to the oil itself, it isn't greasy at all which is exactly what I look for. Even so, I only used a tiny bit in my bath as the aroma is so powerful that the smell was quickly dispensed throughout the room by the bath's steam. It smells so incredible, like a walk on a warm day through a sunny garden of roses, but with just enough of a hint of ylang ylang for that added rich sweetness. Usually I read a book or catch up on posts while having a soak, but all I could do was daydream this time. My mind was just so blissed out, and my post-yoga muscles were thanking me for the TLC as well! There was no residue on the edges of my tub, so that is an automatic perk -- easy cleanup! While I didn't find this an intensive moisture boost, my skin did come out feeling silky and soft, so it definitely is doing the trick. I think this bath oil is perfect for spring, summer, and autumn, as it is lightweight and does not cling to the skin or leave any oily feeling when you get out of the water. 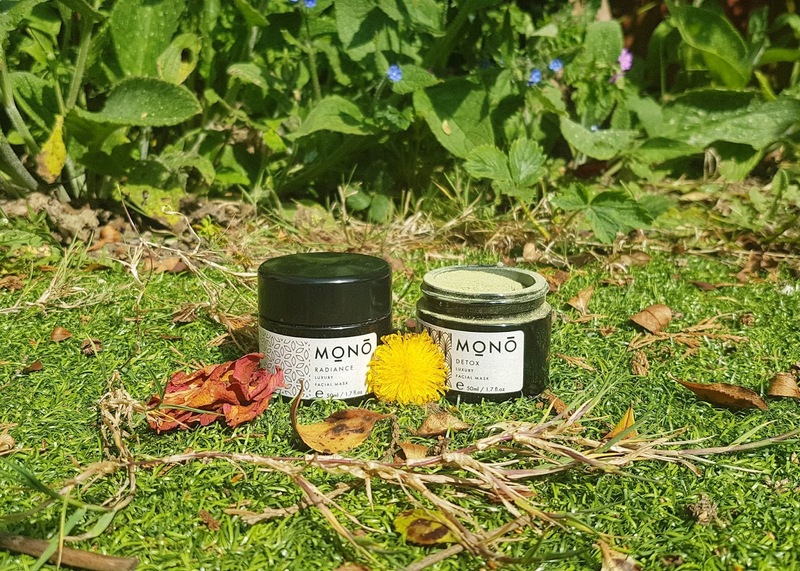 However, I do think my skin needs something a little more heavy duty in the dry winter months, so I think I would still need to use a balm or butter afterwards during the colder weather. For now, I am enjoying the balancing effects of this blend from The Rose Tree, along with the lightly floral scent it leaves behind on my skin. I also love how I felt more radiant, both inside and out after using this bath oil -- at the end of the week it is so great to feel so restored and pampered! My only wish would be for a more precise way of measuring out product. I wouldn't want the bottling to change at all as I love the wire clamp method of closing the top, so I am unsure how this would be possible. But something I always struggle with is what "a drizzle" or other similar measurements means. I always wonder if I am being too generous or being too stingy when it gets down to it. Or maybe I just need to learn a better drizzling technique? 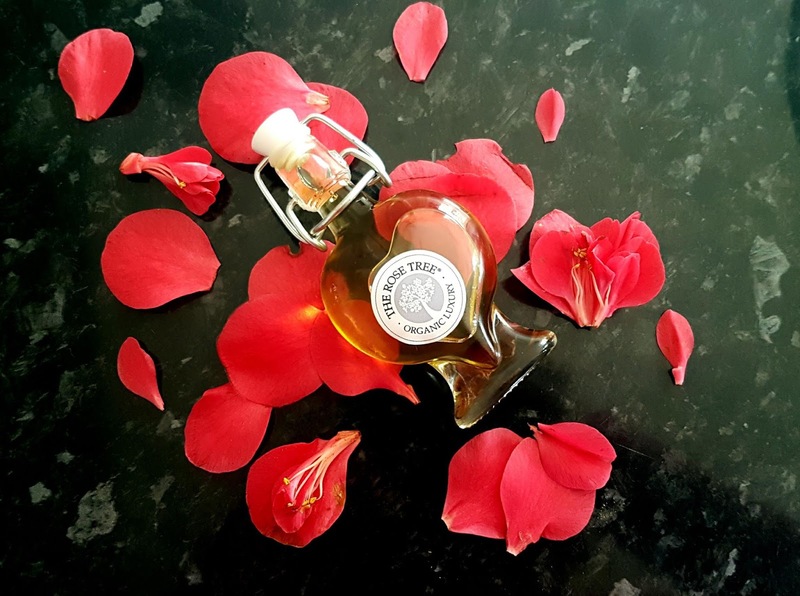 Overall, my feelings about The Rose Tree bath and shower oil have blossomed after each use. Not only is this free from nasties I avoid like SLS and other nonsense (I mean, why would you ever put SLS in an oil?? ), it is made with 78% organic ingredients that have been expertly blended to create a calming and moisturizing skincare treat. All in all, I think The Rose Tree has lived up to their promises, and I can't wait to be able to try out more from their range! Have you tried anything from The Rose Tree? Let me know down in the comments below what you think of bath and shower oils, and if you would like to see me try out more from this lovely natural beauty brand's collection. This oil sounds absolutely amazing! I love the fact that it is light weight too, I don't like to feel like my skin is sticky! This sounds gorgeous, the smell of roses is one that just automatically relaxes you and takes you away to a happy place. Not sure what LLABP is but this looks like a great British company. I love the fragrance of Rose. I always think it's really luxurious. I always find myself adding a bit more than a splash or a drizzle, mostly because the stuff I use smells amazing! a rose bath oils sounds incredible. And I agree with you - why would something like it need SLS in the first place?! What a lovely bath oil. I personally really dislike ylang ylang but I do adore rose. This sounds very good for your skin as both those flowers have fantastic aromatherapy properties. This looks like such a great product and I love the clamp closing top and the shape of the bottle too. This sounds fab and the bottle is sooooo pretty! I'm not really a bath type of person so I'm not sure it would benefit me in the shower!